Geminoid F is working as an actress, taking the stage in a play that opened yesterday in a Tokyo theater. 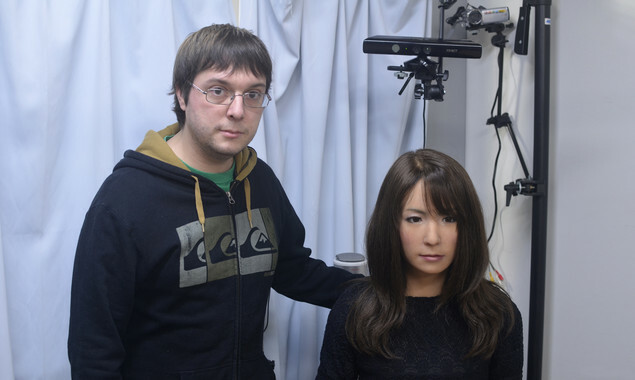 In the 20-minute play, titled “Sayonara” (“good bye” in Japanese), the android shares the stage with another actress (of the human kind) named Bryerly Long. Long plays the role of a young woman who is suffering from a fatal illness and whose parents bring her an android to serve as a companion. A human operator controls the robot from a soundproof chamber behind the stage. A microphone captures the operator’s voice and cameras track head and face movements. When the operator speaks or moves, the android follows suit.The robot is in a permanent sitting posture, so movements are limited to the head, torso, and arms.